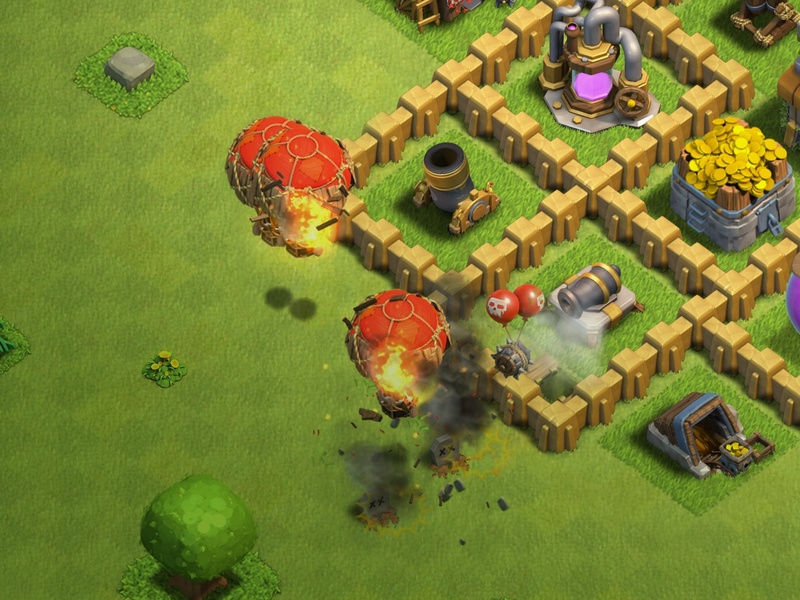 The Air Bomb is one of many Traps in the Clash of Clans game. Explodes when a flying troop comes into proximity. Essentially an airborne version of the normal Bomb, though the trigger radius and blast radius of the Air Bomb is much greater. 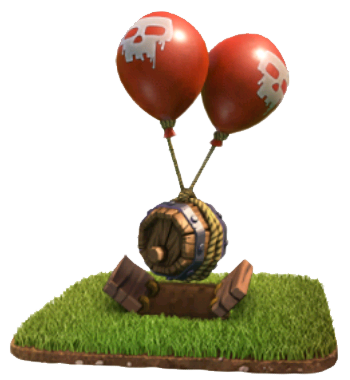 Extremely effective against large groups of Minions, and does a significant amount of damage to Balloons (especially level 3 and below). It’s much less effective against higher health targets such as Dragons. Once activated, traps must be re-armed in order to be a part of the next defensive Layout. When initially constructed, the Air Bomb is a barrel under a trap door with two red balloons attached to it. The balloons have white skulls painted on them. At level 3 the Air Bomb has spikes on its surface and can be seen more easily within its compartment, and the compartment opens up slightly. It is possible for a Minion to outrun an Air Bomb if one is set off while the Minion is moving to another target. The bomb would then be led astray and eventually blow up on its own. 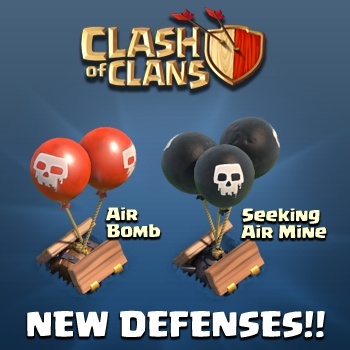 The Bomb, Spring Trap, Giant Bomb, Seeking Air Mine and the Air Bomb produce the same sound when tapped or selected. Like the Seeking Air Mine, placing an Air Bomb next to the Air Defense can turn out pretty deadly. After a Ground Troop destroys the Air Defense, the enemy might deploy all of his or her powerful Air Units at once, and the Air Bomb might be able to take down one or two, or if you are lucky, most or all of them. If you want your aerial Troops to be safe from Air Bombs, have the weakest aerial troops available while raiding and deploy them in the specific area where an Air Bomb may be. This will trick the Air Bombs into attacking them, letting your other aerial troops become safer. – Tapping this icon begins upgrading the trap to the next level, if you have enough Resources, Town Hall Level and a free Builder. When the Trap is at maximum level, this icon is not shown. – Tapping this icon, which is displayed only while an upgrade is in progress, instantly finishes that upgrade at the cost of the displayed number of Gems. Spending the Gems this way is not recommended. – Tapping this icon, which is displayed only while an upgrade is in progress, cancels the current upgrade and refunds half of the upgrade cost. Canceling the process of improving and to losing thus half of the Resources spent is not recommended.